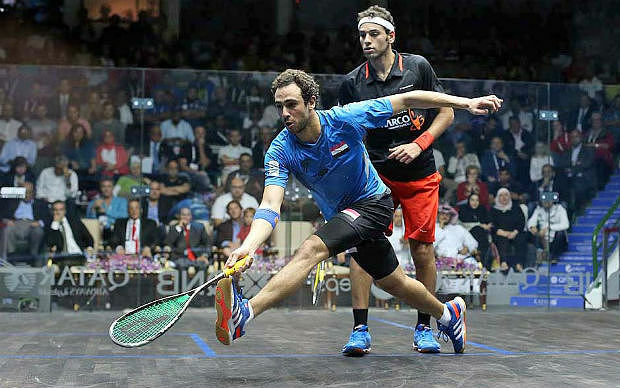 Everyone knows there is something special and different about top Egyptian squash players. What exactly is it? Most are very attacking and appear extremely confident in their ability. It can certainly be intimidating, especially if you are a young junior. 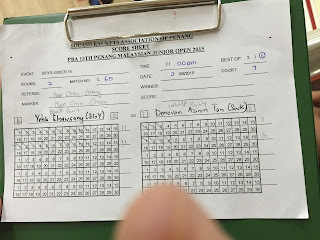 When I was in Malaysia recently for the Penang Junior Open there were a number of talented Egyptian players there and I made a few notes about their style of play and the reasons for its effectiveness. - the knock up matters. focus on yourself and not on how good your opponent looks! - have a game plan. what is your strength? can you execute it? can you contain the Egyptians attacking game and pace? Can you attack them before they attack you? Or can you force them into long rallies and making mistakes as they lose their patience? - don't give them too much respect. there seems to be an aura around playing Egyptian player. although they have many amazing players, so do other countries. if you're going to win you need to believe in yourself and that you can and will win. - don't get involved with the ref if they stall, block, ask for cheap lets or begin talking with their coach between rallies. At least I wouldn't. I feel this distracts your attention and once it gets under your skin it's very hard to let go of it. This just doesn't happen in Canada. There are some benefits for the Egyptian girl in this situation. It's like the coach telling her what to do during the match when things get tough and emotional. Her coach can calm her down and is playing a major role in the match. If you played someone like this what would you do? Do you say something to the ref or just accept that this could happen and let it go? It's hard to say which is the right answer. The ref in this situation wasn't getting involved with this and let this go. It was pretty shocking. It was evident that there is some bad blood between the Egyptians and Malaysians. This may have increased because of the incident at match ball in final of the girls under 15 British Open last year. The Egyptian coach was very outwardly expressive and passionate. We see coaches like this in American sports like football or hockey, but we aren't accustomed to this in squash. 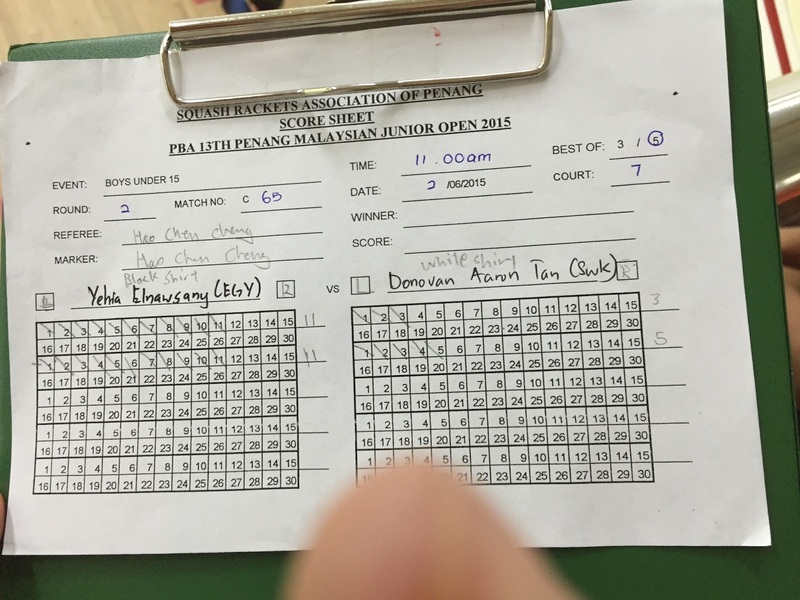 I should also mention that I saw one Egyptian boy in Penang in the under 15 who looked very calm and relaxed (his score card below). Maybe it's because I didn't see him in any tough matches, but he was smiling and really appeared to be enjoying his squash. I don't know if this can be taught. It must be difficult as an opponent to play someone like this. You can tell they are just so relaxed and confident. I don't think this is something you can fake either. At the end of the day, squash is a game and it was refreshing to see someone at that level so relaxed and happy. The Egyptians are doing a lot right. Are they taking advantage of the rules or are the rest of us just not passionate and expressive enough about squash and winning? There's an argument for both sides and the ideal solution is probably somewhere in between the two. It's definitely more entertaining watching a talented Egyptian play. Hopefully the next time you play an Egyptian you don't give them too much respect and let them win. If their going to win, make them beat you; make them play their best squash and use as many fist pumps and stalling tactics as possible. Believe in yourself and you have a chance; believe in your opponent and you don't. Squash is about controlling the game and keeping momentum. Unfortunately this is not just about how you play but how you interact with your opponent between points and control the gaps between points and how your supporters behave - without even getting into the more direct ways of "cheating" such as not providing direct access and playing the referee. Since I'm both Egyptian and Canadian, let me point out a couple of things about the Egyptian style. 1. Attack and vary: don't sit back and play long rallies, it's both boring and vulnerable. The vary part is important, as it drains the other player mentally. 2. Egyptians are both relaxed and passionate people. Players leverage both qualities. You cannot learn or teach that.